UPDATE: Grant Rodiek has clarified his comments on Twitter. Sims will not have an emotional reaction to their body weight. Well this is interesting. In The Sims Studio’s efforts to infuse an entire brain-rainbow of believable human emotions into the next generation of sims, they’ve hit upon the tricky business of body image, and its psychological bedmate since the invention of the mirror: perpetual, crippling self-loathing. 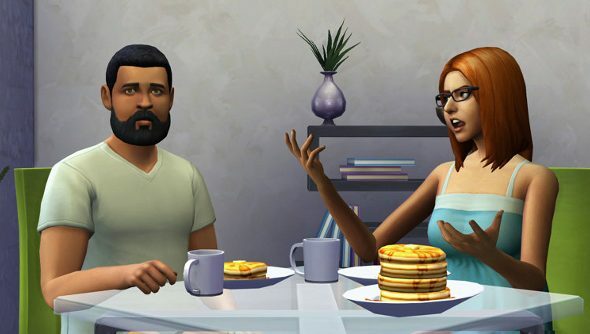 Sims in The Sims 4 will have the ability to gain and shed pounds as they eat and exercise, as well as the capacity to feel grossly unhappy about their own appearance, which is a cruel degree of realism to inflict upon an innocent simulated person. Previous games in the series allowed you to manually set your sim’s weight and body shape in the creation screen, and fitness objects such as treadmills and weight machines would simply improve a sim’s strength rather than sculpt their body. In The Sims 4 it seems that maintaining your desired form requires some actual management of your sim’s diet and exercise routines. To that end, The Sims Studio is also simulating body dissatisfaction; Sims don’t always like what they see in the mirror, and it will affect their emotional state, something the developer is aware of being a potentially problematic feature. That’s some top marks diplomatic wording, but it’s not totally clear whether the studio might be unthinkingly imposing an equivalence between thinness and happiness in The Sims 4, which is a worry considering this game’s young and female audience. At least they do seem concerned that a sim’s reaction to their own physical appearance sends an important message about what Maxis believe to be the correct body shape. You could also make the argument that, in order to properly simulate a human, it would in fact be more accurate to fill them to the brim with every sort of body insecurity that society, glamour mags and yoghurt advertising bombard us with on a daily basis. Either way you slice it, body image politics in The Sims 4 presents something of a conundrum. One of potentially many, no doubt, if The Sims Studio seeks to simulate the human condition any further.